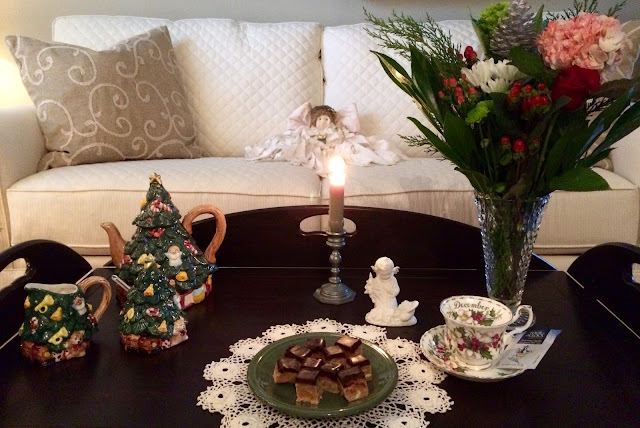 For today's Christmas tea, I'm using the teapot and cream and sugar that my youngest son gave me when he was just a little boy, and we'll have a piece of Buckeye Fudge with some Black Forest Tea that a sweet friend sent me. 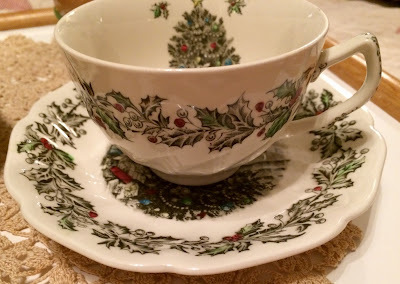 Another dear friend gifted me with this Royal Albert teacup that came from her late mother's collection. 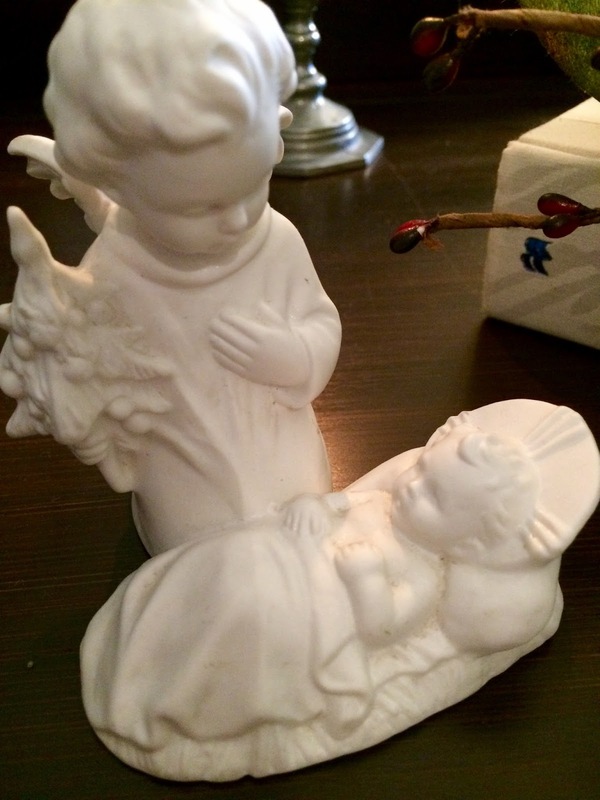 My late beloved Dad gave me this darling Goebel baby Jesus and angel piece back in 1979. Isn't it sweet? I just treasure it! 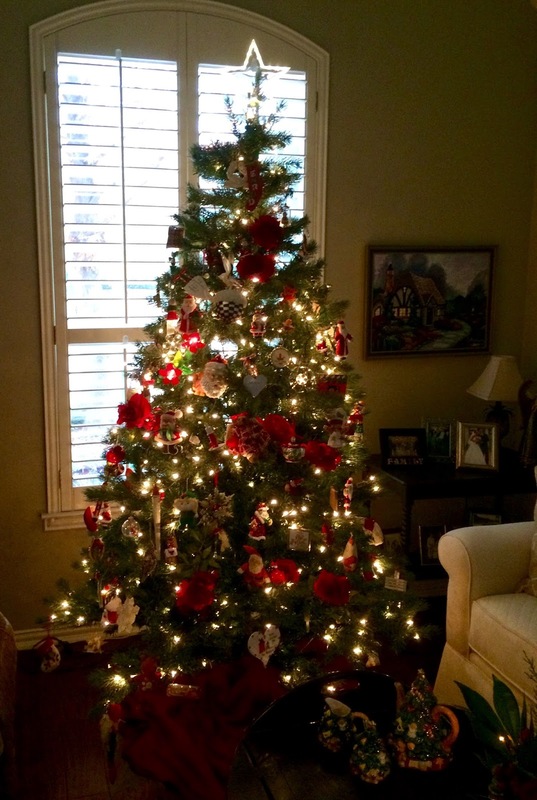 When I was in Ohio for Thanksgiving, my son, Mike, surprised me and put up this tree in the living room. I hadn't put it up since my late Beloved passed away. It really touched my heart! Recently I won this McKenzie-Child's ornament from the Traveling Tote Tribe. This is my very first piece of McKenzie-Child's! Thank you to Debbie, Sarah, Patti, Rita, Emily, and Linda. A sweet friend sent this adorable teapot ornament. Isn't it darling? I grew up in Columbus, Ohio, and graduated from Ohio State, where Buckeyes are the symbol, and also a yummy candy. 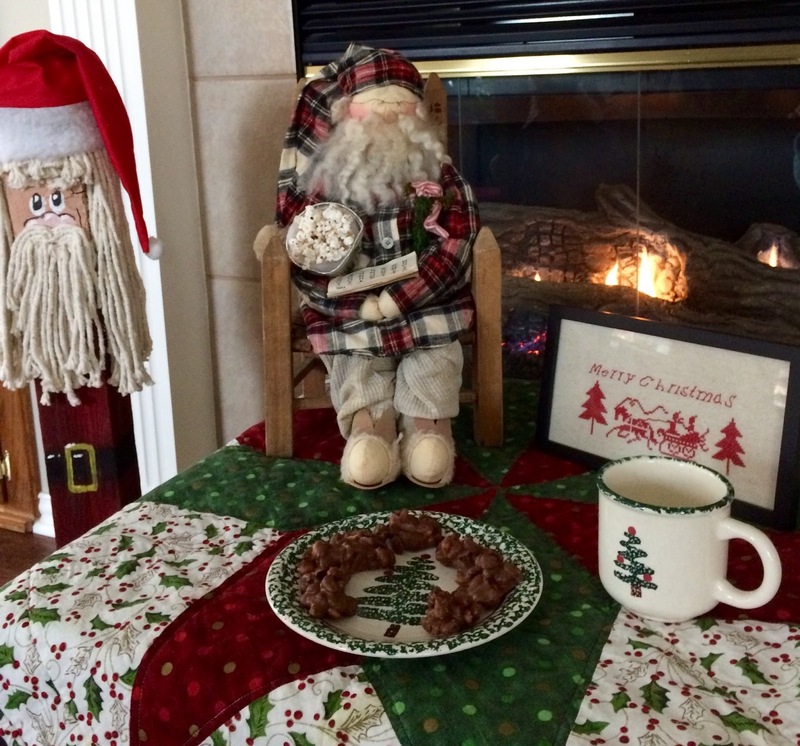 This fudge is an easy version of Buckeyes, and it's made in the microwave. I hope you'll try it! Line a 9-inch square pan with foil; spray with cooking spray. In a large microwaveable bowl, microwave peanut butter chips uncovered on medium power in 1-minute increments 3-4 minutes or until melted and smooth, stirring well after each minute. Stir in sweetened condensed milk, peanut butter and peanuts until blended. (Mixture will be thick). Press mixture evenly into pan. Refrigerate for 30 minutes. In a small microwaveable bowl, microwave chocolate chips and heavy cream uncovered on high power for 60-90 seconds; stir until smooth. Spread evenly over chilled fudge. Refrigerate about 2 hours or until chocolate is set. Lift foil out of pan and cut the fudge into 8 rows by 8 rows. Store covered in refrigerator. However, I prefer to eat this fudge at room temperature! 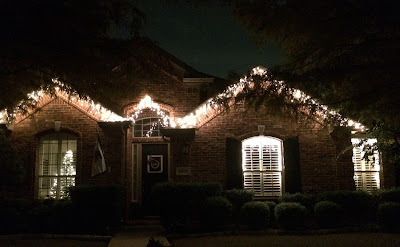 My son also surprised me and put up icicle lights around the front and inside the windows. That's our Ohio State flag blowing in the breeze. This old kitchen Santa is one that my daughter gave me years ago, when we exchanged Santas. Isn't he cute in his corduroy overalls and flannel shirt? 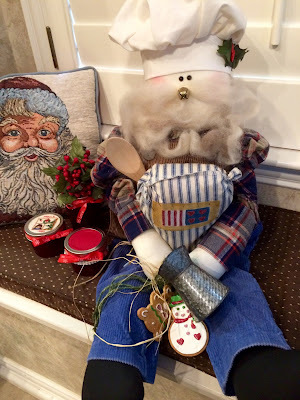 Don't you love his metal pail, cookies and wooden spoon, with his sack of flour? He always makes me smile and today he was in the kitchen when I made Christmas Jam. My dear Mom made me the Santa pillow. 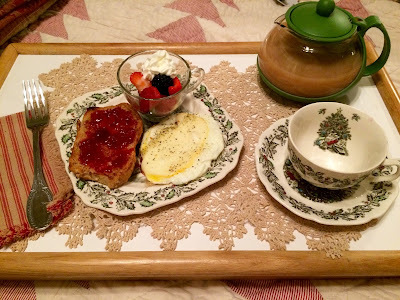 Every single morning, I have breakfast in bed, unless grandkids are spending the night. 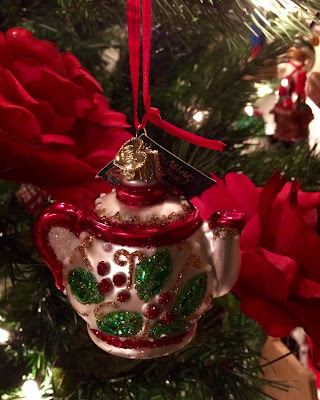 I always put milk in my teapot, so it's ready to pour. I love the vintage look of this teacup by Johnson Brothers, and I have the matching luncheon size plate to use for my breakfast. Here's my bed after I make it for the day. 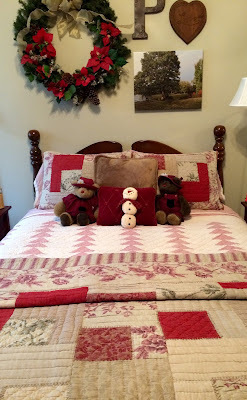 I love the red quilts for Winter time, and red always makes me happy! The bears were gift from my late hubby many years ago. This is my view from my bed. 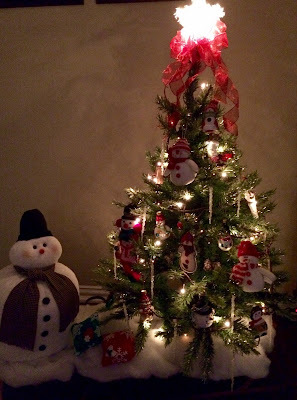 I made the Chubby Snowman and I placed the tree and him on my childhood sled. 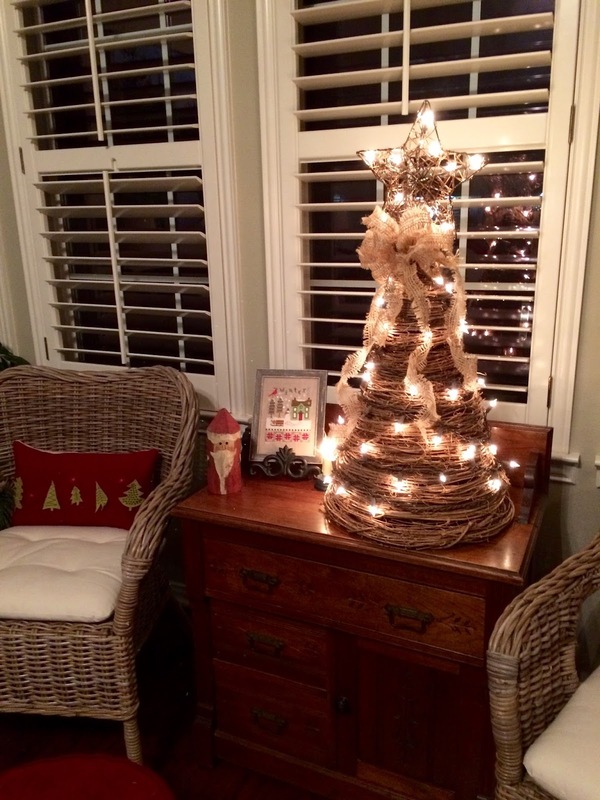 The lights are on a timer and pop on for a few hours in the morning and then again in the evening. You can see how I made the snowman by looking here. 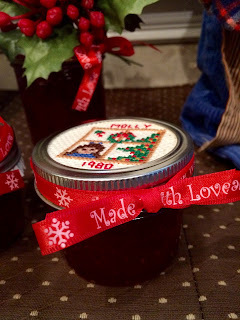 My late beloved and I always made several batches of this wonderful jam to give as gifts, and now I make it by myself, and remember our times together in the kitchen. 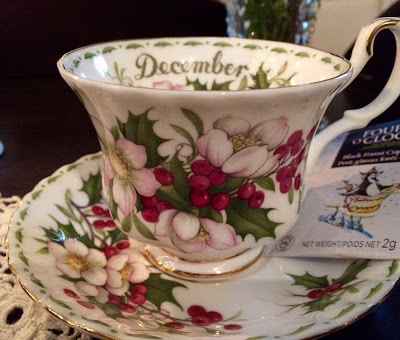 You can decorate the jars by using muffin liners, ribbon, cross stitch, springs of holly, etc., or doilies. Coarsely chop cranberries in a food processor. Combine cranberries, strawberries, sugar, and butter in a Dutch oven, and bring to boil, and cook for 1 minute, stirring occasionally. Remove from heat, and add liquid pectin to mixture. Return to heat and bring to a full rolling; boil 1 minute, stirring occasionally. Remove from heat, and skim off foam with a metal spoon, if needed. Quickly pour jam into hot sterilized jars, leaving 1/4" headspace, wipe jar rims. Cover with metal lids, that have been boiled in water, and screw on bands. Process in boiling-water bath for 5 minutes. NOTE: Instead of processing in a boiling water bath, I turn the filled, lidded, banded jars upside down for about 5 minutes and then turn upright. In a few minutes, you should hear the jars seal, with a "ping". I have never had this fail, and this tip was shared by a friend about 40 years ago. 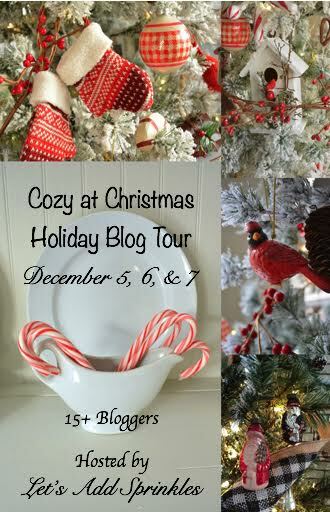 I am participating with the Cozy at Christmas Holiday Blog Tour, organized by the lovely Katie, at Let's Add Sprinkles. You can find a list at the bottom of my post of all the other participants. 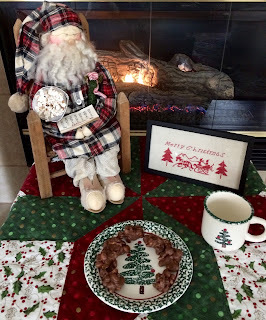 Today we are going to enjoy a fireside tea with some yummy candies that are so easy to make! How about we have some Christmas Tea from Twinings to warm us up? 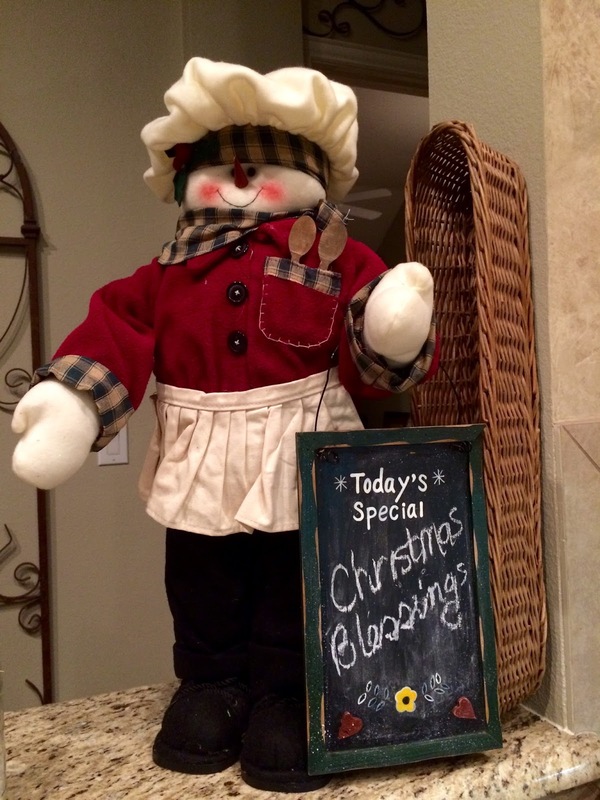 I'd like to show you some of my favorite Christmas decorations. The big star quilt was one I machine stitched several years ago to blend with my favorite Christmas dishes. My son, Mike, made this Santa for me when he was in the 10th grade. I had seen something similar in a magazine and he built it, painted it, and I made the hat and used a mop for the hair and beard. It's cute, isn't it? 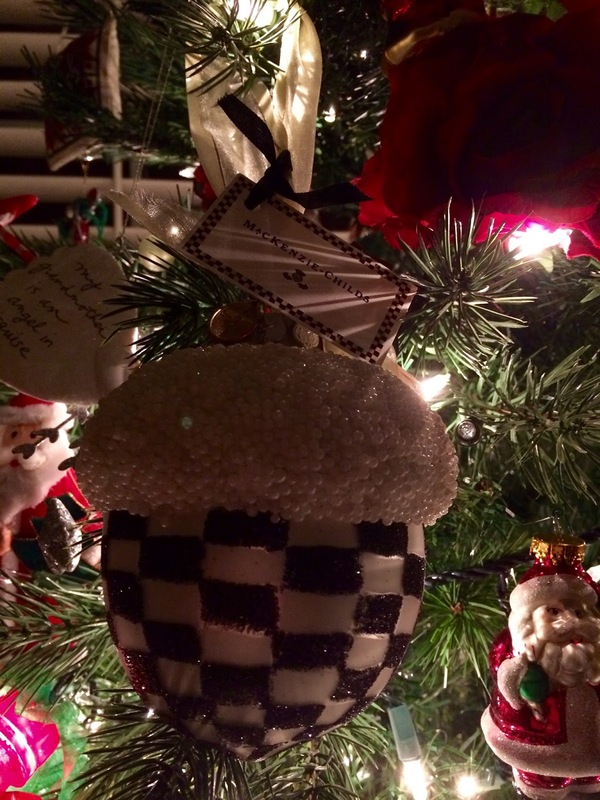 My daughter and I used to pick out a Santa each year to give each other and she chose this for me, back in 1996. 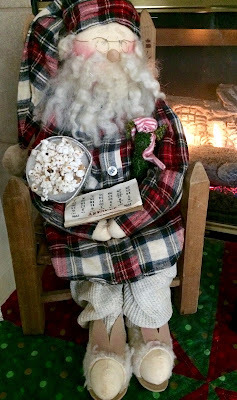 Don't you love Santa's bunny ear slippers, and his pail of popcorn? Gosh, that popcorn is 20 years old! This Christmas mug hold special memories, along with the set of dishes, that my late beloved and I collected from various Target stores so very long ago. 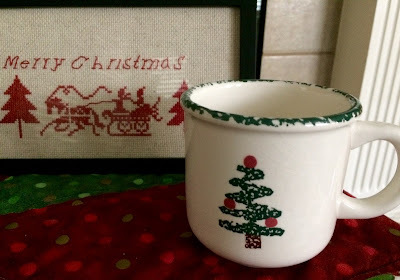 The cross stitch was gifted to me from a special neighbor. My "kozy kitchen" and family room are all open to each other. 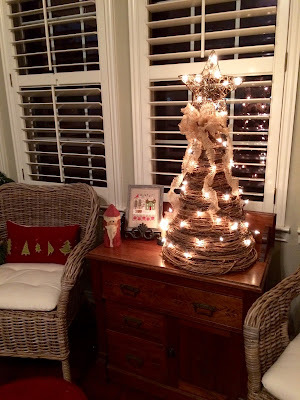 My willow tree was sent to me from my mom and sister. It looks so pretty sitting between my chairs. 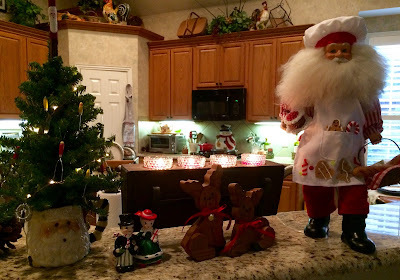 My little tree on the counter is decorated with tiny kitchen utensil ornaments, with a cinnamon stick Santa on the top. The sweet caroler salt and pepper couple were given to my mom from a dear friend, back in the 1960's. I just love their vintage look. 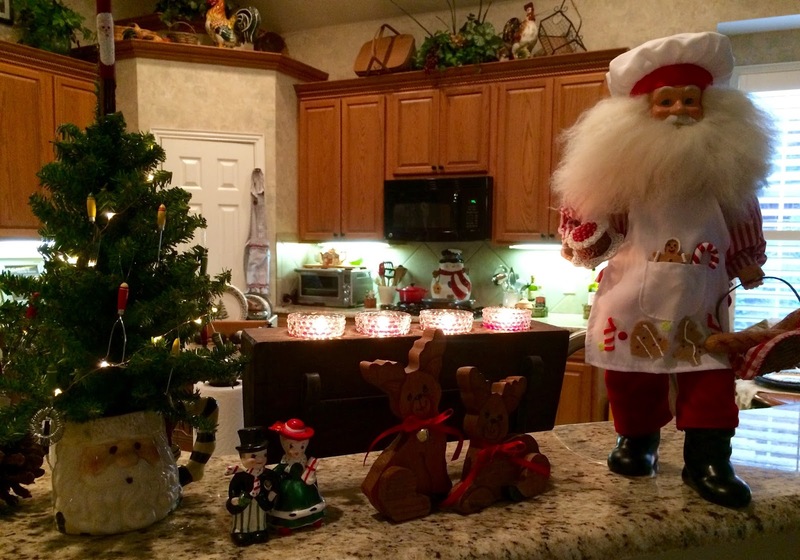 My Baking Santa is perfect for my kitchen counter. The reindeer were another gift from a talented friend who cut them and painted them. Thank you for your visit to my home, and thank you to Katie, at Let's Add Sprinkles for organizing this blog hop. 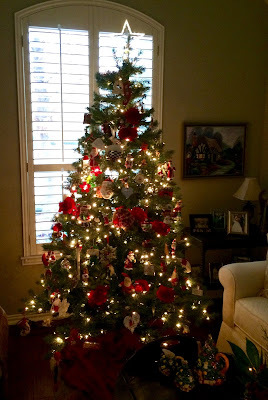 May many Christmas Blessings come to you and your families! 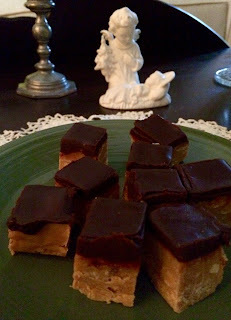 This delicious and easy candy is adapted from Trisha Yearwood's recipe. I'm sharing the full recipe, but I only make half, and it still yields many, small size pieces. It's a great candy for kids to help with. Put the peanuts in the bottom of a 4 quart slow cooker. Layer the German Sweet Chocolate, followed by the chocolate chips, and then the almond bark. Set the temperature to low. Place a paper towel under the lid of the slow cooker, to absorb any moisture, and cover. Do not stir the mixture. Cook for 3 hours. After three hours, add the dried fruit, and stir the mixture until it is smooth. Drop the candy into cupcake liners, about 2 tablespoons per liner, or drop candy onto waxed paper. Allow the candy to cool completely. Enjoy!